The Ambassador and I actually picked up Men of Wrath in issues as it was coming out. Somehow we missed the last issue. Since we couldn't find the final issue The Ambassador just bought the graphic novel when it came out. 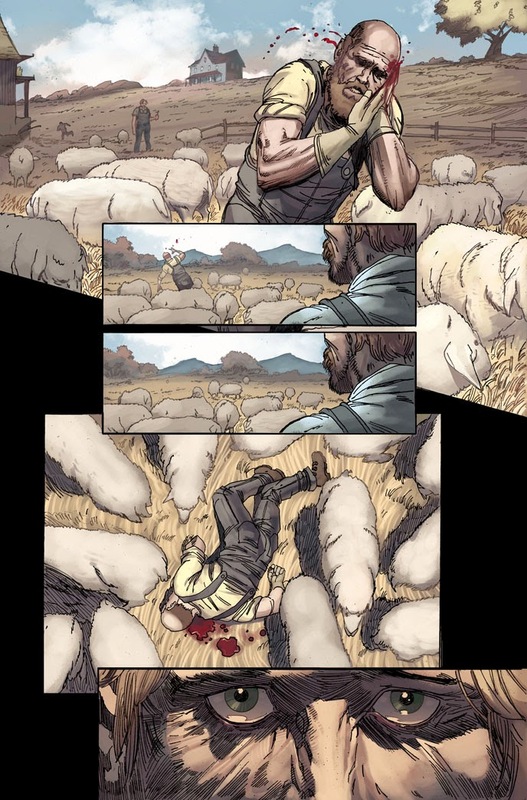 Superstar writer, Jason Aaron, created Men of Wrath with living legend artist and longtime collaborator, Ron Garney. Experienced colorist, Matt Milla, throws in with this motley crew. As Jason Aaron states in his introduction and we emulated in our comic book podcast reviews, this is rougher, meaner, and unlike anything Ron Garney has done before. We were so impressed with how dark and gritty this was in comparison to his other work. I had read Ultimate Captain America with Aaron & Garney but that was leagues different from this. There are few things I enjoy more in comics than seeing an artist grow and expand themselves like Garney does in this. Ron excels at expression in the eyes. The eyes tell so much, have so much emotion and bring a level of intensity that is unmatched. There is an egregious amount of detail in each panel, page, landscape, character, face. Matt Milla's colors set the tone throughout this book and especially the various timelines. Just to be clear this is not a time travel story. The story does span over time. It's a story about legacy. It's starts on a farm in Alabama back in 1903. Isom Rath got into an argument that day that lead him to stabbing a man. That man died. Isom's son saw it all. That created a blood lust that went on for generations of Rath's. The actual story focuses on the meanest most ruthless Rath there's ever been, Ira. He's a hitman, finds out he has cancer, and receives a job to kill his own son. You see the story play out as father and son struggle between fighting or giving into this blood lust that has plagued their family for generations. If you've read anything by Jason Aaron before you know his work is solid. The story and characters are unpredictable, fresh, and unique. When you get Aaron and Garney together you see fireworks because their chemistry is magical. Jason kills it on dialogue. Together Ron and Jason slay the story. They have never done anything like this as a team before. Here's to hoping they do more. Jason Aaron and Ron Garney create a new, different, intriguing, short, intense, magnificent tale of family, violence, blood, death, desperation, hate, evil, and a curse. TNTM The Show Gamescast: Return of Tony B.